More Pictures From October 2018! Well, I should have looked at my memory card again before publishing last week’s post of pictures. There were several more good ones. Mr. Diligence made the lions for the skit they performed at the concert. I found him a picture of a lion online, and Esther enlarged it. He glued them together, cut them out, and painted them. Then, he glued them to cardboard and made them stand up. Simon learned to ride a backwards bike when someone loaned them one many years ago. He has wished for one ever since, so when he had a couple of days off work on a recent long weekend, he built one. When you turn the handlebars right, the wheel turns left, and when you turn the handlebars left, the wheel turns right. So far, all three of the older boys have learned to ride it. I looked in the living room recently and saw Mr. Imagination telling Goofball to hold still. He wanted her to pose for him to draw a picture of her, but she wouldn’t cooperate. I suggested he hold her still while I took a picture, and then he could draw from that. Here is the picture he drew and cut out. Some of our friends from Dead Boring came to see us a few weeks ago. We met in Moana, and had a picnic together beside Lake Brunner. They had two 9-year-old girls along, and Little Miss, once she warmed up to them, had great fun helping them build a “hut.” It was basically an outline of grass, with flowers arranged artistically in it. I wished I had taken a picture of this scene earlier. When we first arrived, the lake was calm and the mountains were mirrored in it, but then a wind came up. It was still beautiful! This coal train came along, and stopped on the side track. Soon, we saw the passenger train come from the other direction and pass it, and then the coal train started moving again. Even though we have moved away from Canterbury, we were still able to participate in this year’s Dead Boring Concert with our old homeschool group. The children wanted to perform a skit this year, so they enlisted the help of friends from here so they would have enough people to fill all the roles. Here are videos of all the numbers our family did. Little Miss taught herself to write her name the way it is on this picture. For a week or so, she spelled it MPI (or IPM or PMI). Then she added the A. Later that evening, Esther showed her how to properly spell her name, and she’s been doing it that way ever since. I’ve never had a 3-year-old who could write like this! She drew the picture, too, by the way, for her grandma when her daddy was going there. We currently have three turkeys—two toms and a hen. They live in this pen. Mr. Diligence decided they need a proper run to live in, so he got started building one. He enlisted the help of his brothers, and got started putting in posts, which are long pieces of wood that Gayle brought home from work for firewood. Mr. Sweetie in the hole. Mr. Imagination in the hole. The run will go out from the chicken coop and around several bushes. Mr. Diligence is hoping that the bushes will provide enough cover for the turkeys to sit on eggs. One of my gardens. By now, the plants are several times bigger! We’ve been harvesting kale leaves and lettuce and radishes from here. The clothesline was supposed to go up and down, but the crank appeared to be broken when we moved here. For a birthday present, Mr. Diligence opened it up to see what was wrong. He discovered that it had simply slipped off the track because someone forced it down too far, so the boys easily fixed it for me. Now I can put my laundry up higher! I bought these cups to start pumpkins in. Little Miss made stacks with them—Daddy, Mommy, and herself! The doll sent to Little Miss by an aunt from America. She named it Susie, and I had the fun of sewing a couple of dresses for it. One of her brothers made this daisy chain for her. Mr. Intellectual moved the sheep across the road for more grazing. I was amused at the way he carried them. Thursday morning, a friend called to tell us that there was a jet boat race happening on the Grey River, and the boats would finish at the bridge over the Ahaura River just down the hill from us. She gave us the times they would be taking off on each of their three trips up and down the river, and sure enough, we soon heard the first round arriving. The second round started arriving shortly before lunch, so we took off down to the river to watch. We were a couple hundred meters past the finish line, so they were slowing down, but we enjoyed watching them shoot under the bridges and stop just upstream from us. After all the boats had arrived here, we walked down stream to wait for them to take off again. When we reached the finish/start line, we learned that it would be another 20 minutes, so we went farther and found a good spot to settle down right at the water’s edge. It was a beautiful, sunny day, and the river bottom was so lovely, with bright yellow gorse and broom flowers all over. Yes, those shrubs are a terrible nuisance, but this time of year they are gorgeous! Once the race started again, we enjoyed watching 19 boats go past. They left about a minute apart, and we could see the spray going up behind them for about 30-45 seconds, for maybe a mile around a couple of bends in the Grey River. I tried to get a video to show the speed, and did get a few seconds—but then the batteries in my camera died. Here are the few seconds of video I got. And there you have it–our impromptu field trip this week! Chautona Havig’s free Kindle book this week is 31 Kisses. I enjoyed it, but didn’t write a review; it’s kind of a “fluffy” book—not a lot to it. It’s just clean, fun romance. A couple of weeks ago, we spent a Sunday with friends who were camping beside a river about 30-40 minutes drive from us. It was a beautiful, sunny warm day, just perfect for being outside—although a couple of us got pretty sunburned, because we aren’t used to being in the sun! The children discovered tadpoles in a boggy spot close to the campsite, so they spent the afternoon hunting. At first, they were finding tiny ones, and then they started finding very large tadpoles. We brought some home, and they took home a large number. The glimpses we got of the snow-capped Southern Alps were gorgeous! This is the Haupiri River. If you’ve ever heard of Gloriavale, it is directly between where we were standing here, and the mountain in the background. My big boys tired of hunting tadpoles and wanted something more exciting to do. They borrowed a rope and used it to lower themselves to a pier of the bridge. Then, they tied a rock to the rope and used it to measure the depth of the river—till the rock fell off! Little Miss loves having girls her own size to play with! The gorse is in bloom everywhere. It’s so pretty—wish it wasn’t such a horrible nuisance! Here is one of our tadpoles. They are living, quite happily as far as we can see, in a tank of rain water with a log floating in it for when they need to climb out. We’re hoping they live long enough to develop into frogs so we can release them! Mr. Imagination wanted to build a car for himself. He ended up with a wooden contraption that his brothers helped him mount on a bicycle. It looks pretty funny, but he had a lot of fun with it for awhile! Little Miss has also ridden her bicycle a lot. This week, though, the training wheels broke off, so she can’t get herself going anymore. I got a video of her while she still could, though. The Vintage Wren is a serial novel released in episodes on Amazon. However, subscribers can get FREE weekly installments (a chapter in length) delivered right to your inbox every Wednesday(ish—life delays it now and then). To sign up for weekly installments, click HERE. I have been reading The Vintage Wren ever since the first episode was released. At this point, I’m looking forward to each chapter as it lands in my inbox each week, so I can find out what Cassie is up to now. We’ve made it to the beginning of April by this time! The January volume sets the stage for Cassie’s journey, as she begins to discover how much she has considered to be disposable. She also begins a relationship with a new boyfriend, while Joel, who has been her friend for many years already, continues to be a friend while wishing he could be more. And, as in almost all of Chautona’s books, there are gems of truth to make you think about your own life. One of my favorites in this book was, “It wasn’t the first time in recent weeks she’d arranged her decisions to play fast and loose with the truth.” That’s a challenge—to make sure I always live honestly! I highly recommend this series if you want something different. If you sign up for Chautona’s newsletters using the link above, you’ll get a new chapter from the series every week! And, I believe that the January volume will be free for a few days soon, so click the link to purchase the book at the bottom of this page. If it isn’t free, check again Friday or Saturday, download it to your Kindle and see if you like this kind of story. I don’t really care about that. I just care that they work. And they do. And they’re cheaper than my Tide. Last Sunday, because several people had colds, we didn’t go anywhere for church. Instead, we had a meeting at home (minus Gayle, because he’s in America spending a little time with his mother), and then packed a picnic lunch and headed off on an adventure that turned into a field trip! You know, that’s a disadvantage of being homeschooled. You never get a day off. Or, maybe it’s an advantage—depends on your perspective! We decided to go explore Waiuta, where there use to be a gold mine. Gold-bearing quartz was discovered on this site in 1905, and at the peak there were 500 people living in the village that grew up around the Blackwater Shaft. In 1951, however, the shaft collapsed, according to a sign at the historical site, and within three months only 20 people were left. A year later, practically all the houses were gone, dismantled to be rebuilt elsewhere. We found it quite fascinating to wander around, studying the various posters that have been put up around the area, and the ruins that are left, trying to imagine the place in its heyday. This is the road that goes out to Waiuta. First, you travel through open farmland in a valley. You pass the old Blackwater School, in use from 1913 to 1949, according to the sign above the door. Then, you drive through thick bush for awhile. A lot of places, it was thicker than this photo shows, with the trees meeting overhead. We wondered if this trough was for watering horses back in the day? At last, you come out in the open, and you have reached Waiuta. The building here was the carpenter’s shop for the mine; the smokestack had something to do with running the mine. Possibly steam power for raising and lowering men and rocks from the shaft, which was just to the right of this picture? There are a lot of non-native plants around, left to go wild from the gardens the miners and their families had. This flowering currant was loaded with blossoms and humming with bees. Simon wants to go back in December and see if there is any fruit on it! We followed this trail to the old swimming pool. The swimming pool was about 36 meters long, according to my boys who stepped it off. The other end was quite deep. Back to the mine site. This machine was used to crush the quartz so the gold could be extracted. Part of the foundations of the building. Inside the chimney. Simon noticed that the bricks are stamped Brunner. One of our next field trips will be to the Brunner Mine site, between us and Greymouth. They also had brick kilns there, besides the coal mine. I think this was the boiler room. These bushes were in bloom. I don’t know what they were, but the scent was amazing! Walking back up to the mine from the area where many of the miner’s houses were. The piles of rocks are tailings from the mine. The area on top has been smoothed and planted in grass. We ate lunch at the edge of the bowling green. It is amazingly flat, with very lush grass. I took this picture to help us find our way around. After we had explored the main area, we drove up the mountain to the Prohibition Mine. This was connected with the mine in the first area we explored, deep underground. From up here, it was 879.5 meters, or about half a mile, to the lowest level of the mine. The sign said that was below sea level! Men were lowered in a cage, and the quartz was brought back up the same way. It took four minutes to raise or lower the men, but the quartz was moved in half that time. This was the mine office. Someone has cut a hole in the door of the strong room, and my little ones crawled in. The view across the Grey Valley from the Prohibition Mine was incredible! This is what is left of the building in which they extracted the gold. It was built between 1937-39, and I presume it was only in operation until 1951, when the mine closed. This turned out to be a great way to spend an afternoon when we couldn’t be with other people! It was a beautiful day, and a very interesting site. And, I didn’t know she was doing it, but Esther published a post today about this trip, as well. You can see her pictures here. 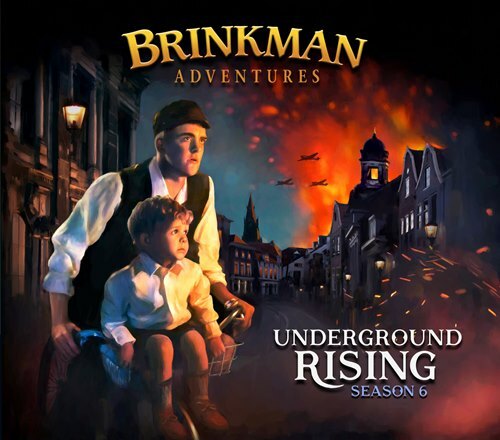 We have been listening to the Brinkman Adventures audio dramas ever since the first season was released. We’ve enjoyed some episodes more than others, of course; some have been absolutely great, and others were not quite so interesting but still good. When we saw that Season 6: Underground Rising was available for review, all of us hoped we could get it, and we started listening to it right away. The first two episodes are about the Dutch Underground during World War II. The stories were quite interesting, and the fact that they are true stories from the producer’s grandparents makes them especially interesting. The 3rd episode, Twice Born Fly, was a fun story about when the father of the family found himself in prison in quite bizarre circumstances. I was expecting the punch line that came, but it was still a really fun story, with a great message. The 5th and 6th episodes, about the Free Burma Rangers, were very exciting. We were nearly on the edge of our seats at times during these stories. Probably our favorite episode, however, was the 4th one, I Wonder Why? This tells the story of a family who moved to India to run an orphanage and experienced some amazing miracles—as well as some very difficult times. I think we appreciated it so much because we could relate to some parts of the story. The children of the family went through culture shock, and had many struggles learning to love those around them, as well as learning to adjust to a completely different way of life. The way they changed through the story was really special. In the episodes about the Dutch Underground, there were stories we quite appreciated, as well as aspects that bothered us somewhat. My favorite part of that story was the scene where the Nazis burst in on a meeting of the Underground. It was New Year’s, so one of the women had made oliebollen, or oil balls, and those treats saved the day. We have a friend who came from Holland, and she makes oil balls every year; we get treated with them when we join her family on New Year’s Eve. That part of the episode was more meaningful to us because of our friend. We also appreciated the attitude of the Underground workers that they wanted to help deliver those who were being taken to death. It meant putting their own lives in danger, but they were willing to do that for the sake of others. On the other hand, the attitude expressed by one young man that, “Life on the sidelines is very boring,” rather bothered me. When he left the sidelines and joined in the fight, he started doing things that go against the teachings of Jesus. I know many Christians believe that war is different, but we take the Sermon on the Mount literally, and don’t believe it is right to use violence at any time. There was also the issue of stealing ration cards—is it right to steal, even in wartime? I know this was a very difficult time, and I’m not sure what I would do if I were there—this makes a good topic for discussion! Another problem we had with these episodes was the very thick Dutch accent one of the narrators has. It was authentic, and I enjoy the producer’s quest for authenticity, but we quickly lost the younger half of the family as we listened to this story, and they didn’t want to hear any more episodes, sadly, although I believe everyone ended up listening to Twice Born Fly. The two episodes about the Free Burma Rangers were fascinating, and very exciting. I didn’t know anything about them before, but what we learned, from the audio drama and from the Real Stories page on the Brinkman Adventures website, is amazing. The dedication these men have to help people who are being attacked is wonderful. On the other hand, as I mentioned above, are Jesus’ commands to not kill suspended in war time? I did appreciate what one person stated in Episode 6, that Jesus said we are to love our enemies. We really enjoyed the Real Stories page. All the children crowded around to see as I looked at the pictures and read the stories on that page. It really adds to the audio version to have this page available and be able to see photographs of the people and events that are featured. At the end of the section for each episode there are a couple of paragraphs to help apply the lessons to our lives. We ended up skipping through those the evening we looked at the page, because it was bedtime and we just wanted to see the pictures—maybe sometime we’ll go back through and get more out of the stories and discussion suggestions. If you are a family, like us, who enjoy listening to stories, check out the Brinkman Adventures. As I said, we have really enjoyed most of their productions. The first season was definitely our favorite, but some of the other seasons have been very good, as well. And, if you are interested in trying them out, they are offering a coupon right now. The code is FALL10 and is good for 10% off all their products. It is live from October 10-31, so go to their website and try out some great audio dramas for your family! A total of 70 people are reviewing this digital product, so please click on the banner below to read other people’s perspectives! We watched a video one day of a man collecting dead leaves, twigs, flowers, and other things and building insects out of them, so Mr. Imagination decided to try his hand at it. This was his creation. He sure has an artistic bent! The cats continue to amuse us. This box with old newspapers in it was Princess’s favorite bed for awhile, so her offspring decided it was THE PLACE to be, as well. One day, we found Grizzly and Goofball sleeping in it like this, cuddled together; apparently, Goofball had been asleep there and Grizzly decided she wanted it, too. A few days later, we found this pose. It must have been too much work to find a way to get her whole body in! Mr. Imagination, with some help from his brothers (maybe more than “some”!) built this boat. It works well, although Mr. Diligence was able to sink it by putting too much weight in, much to his satisfaction. A friend sent Little Miss a card, just because. The card had a hole cut out of the front, so Little Miss made Goofball look through it. The latest design for a boat—cut up barrels and weld them together for a double-hulled canoe. It’s still waiting for more time to finish it, though. Poppy, a week or so before she calved. I was walking home from checking on Poppy before she calved, on the road that goes east from our town, looking at the mountains to the west of us. It was so pretty, with range after range going off into the distance. Since I was looking into the sun, the picture turned out dark, but in real life it was quite light. Little Miss loves books. If you say something to her, though, about reading them, she’s quick to respond that she can’t read. Our new baby! This is Pansy, a purebred Jersey heifer. She’s full of personality, and very smart. Also, very stubborn. So cute and full of life, though! We visited some friends in Canterbury last weekend, and the boys set an eel trap. They didn’t catch anything, though.